Offering you a complete choice of products which include scr commutation techniques instruments, filterability apparatus, sedimentation studies apparatus, flocculation test unit, ion exchange unit and anaerobic digester. 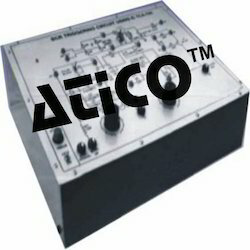 Advanced Technocracy Inc. is Manufacturer, Exporter & Supplier of SCR Commutation Techniques. The Filterability Apparatus utilises a bed of granular material, which can be chosen by the investigator to suit their own purposes. The measurements taken with this apparatus enable a filterability number to be calculated, which has significance in deep-bed filter performance. Sedimentation is the process for the simplification of water and wastewater. Particles settled from the suspension depends on the two things which is the concentration of the suspension and the characteristics of the particles. In this process, the sedimentation is the process to study the different characteristics of sedimentation. Students can resolve the effects of initial concentration and initial suspension height on sedimentation rates. With these effects you can also determine the effect of particle size distribution and the using of flocculating agents. 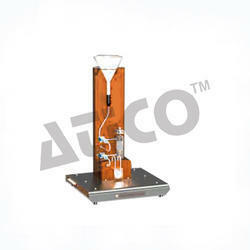 It is used to conduct to conduct the flocculation test in the laboratory. This test is also known as “Jar Test”. It consists of 6 Nos. of Glass Flocculating vessels. These are situated on translucent base and lightened from the bottom by a florescent lamp. A bench top unit comprising an internally illuminated base and a backboard supporting a control console. Six stirrers with stainless steel paddle shafts and blades linked to a variable speed motor. Stirrer speed range typically 25-240 rpm. Stirrer assemblies are easily demounted to allow the test vessels to be removed and cleaned. Coagulation tests in conjunction with activated carbon. Analysis of a water or waste preparatory to the design of a treatment sequence often involves coagulation and flocculation tests, ‘Jar tests’, in the laboratory. Jar tests are routinely used for the control of plan operations and are performed by treatment plant operators. The tests serve to indicate the optimum chemical dosages for removal of turbidity and colour, including such parameters as pH adjustment, and the supplemental use of activated carbon. Jar tests, furthermore, yield a wealth of qualitative information on the rate of agglomeration as a function of energy input (paddle speed), the settleability of the floc formed, the clarity of the supernatant water (which might be related to the subsequent length of filter run). Coagulation and flocculation tests may be used, in conjunction with other tests, to study basic processes including, for example, the kinetics of reaction and the removal of trace constituents from aqueous solution. A bench-mounted framework incorporates facilities for six tests to be carried out simultaneously. The glass flocculating vessels stand on a translucent base which is illuminated from below. Each flocculating vessel incorporates a stirrer paddle driven by a variable speed drive. The paddle assemblies are easily withdrawn for removal and cleaning of the test vessels. The paddle shafts are made of stainless steel to resist corrosion. Paddle speed is accurately maintained by electronic feedback control. A digital display clearly indicates the speed which is fully variable. Alternatively, the use of two adjustable presets allows repetition of pre-selected speeds. down the paddles stop and an alert sounds. 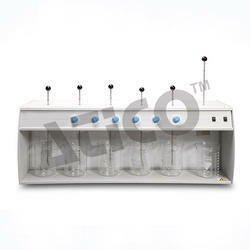 Ion Exchange Unit is used to exchange the ions. The transfer of ions occurs between two electrolytes or between an electrolyte solution and a complex. Ion exchange refers to purification, separation, and decontamination of aqueous. The usual ion exchange material employed in water softening is a sulphonated styrene-based resin, supplied in the sodium form. This has a strong affinity for calcium and magnesium ions and will also remove ferrous ions after the almost complete removal of calcium and magnesium. 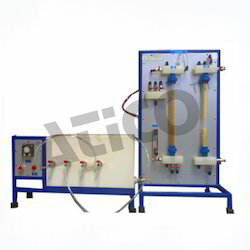 Softening may be carried out as a batch process by stirring a suspension of resin in the water until equilibrium or an acceptable level of hardness is reached. It is more convenient to operate as a continuous flow process, passing the water slowly downwards through a column of resin beads. The exchange reaction takes place rapidly enough for the upper layers of the bed to approach exhaustion before the lower layers are able to exchange ions. Thus there is a zone of active exchange which moves down the column until the resin at all depths becomes exhausted. The position at an intermediate stage is illustrated. When the zone of active exchange reaches the bottom of the column the emerging water begins to show an increasing hardness. This is the breakthrough point when it becomes necessary to regenerate the resin with a strong sodium chloride solution. Self-contained apparatus either for single bed water softening or double bed system for demineralisation. Two vertical transparent tubes house the resins. A manifold at inlet/outlet allows flow configuration changes. 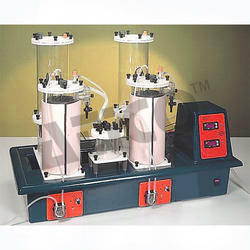 Equipment includes pump, valves, conductivity meter and sumps for regenerant and test or wash solutions. Typical commercial cation and anion resins are supplied. This product is used for sewage treatment and bio-gas generation. It is the process in which animal or food waste used for the production of biogas and biofertilizer. the low level of COD removal exhibited by the acidogenic stage compared with the methanogenic stage. It is the process which is used for biological treatment such as aerobic microbes to stabilize the solids. The mass of received organic waste is also reduced by using biologically destroying volatile solids. Aerobic and facultative microorganisms use oxygen and get the energy from the accessible biodegradable organic matter in the waste sludge. For this process, we have all products of best quality. 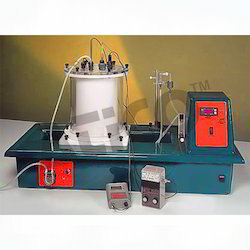 A 10-litre bench mounted aerobic reactor, complete with peristaltic feed pump, air compressor and temperature control system. Dissolved oxygen and pH probes and meters are included. The reactor consists of a cylindrical porous liner held in position with sealing rings between the lid and the base to facilitate removal for cleaning and replacement. Suspended solids are thus held within the reactor volume, whilst treated water permeates through the porous liner into an outer annular exit chamber. The water level is maintained by an adjustable constant head overflow device. This digester system is designed to operate safely and reproducibly for periods of many days. The equipment is mounted on a moulded plastic base, equipped with an internally moulded drain channel, designed to cope with spillages and wash-down water. 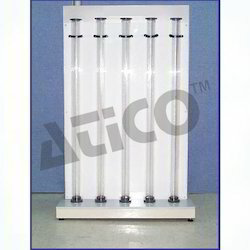 Looking for Water Treatment Apparatus ?